Learn about our providers and practice history. Fairfax Allergy, Asthma and Sinus Clinic began more than 20 years ago when Dr. Cheryl C. Rosenblatt completed her allergy fellowship training at Walter Reid Army Medical Center in Washington, DC. Dr. Rosenblatt had enjoyed practicing pediatrics for more than 10 years prior to training at Walter Reid, but found she had a special ability to help manage asthma and allergy in her patients. The practice grew, and soon Dr. Rosenblatt found herself operating several offices in Maryland, and Virginia. 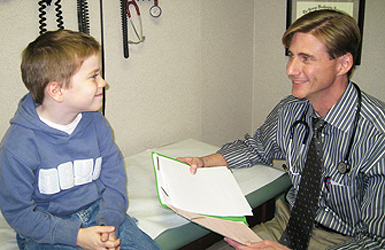 Dr. Johnson joined Dr. Rosenblatt in 2001, after serving as the director of the division of allergy and immunology at Temple Children's Medical Center in Philadelphia, PA. The doctors found they had very similar philosophies, and their focus on treating not just the disease, but the entire patient, led to happier and healthier lives for their patients. Since Dr. Johnson's background was also in pediatrics, he felt right at home working with infants and young children, as well as adults. Dr. Rosenblatt passed away in 2008, but she left us with the charge to carry on her legacy and continue to treat the patients that she cared so deeply for. Many of the present day staff members have been with the practice for more than 10 years, and have been able to watch families grow and return with their children. From all of the staff members at Fairfax Allergy, Asthma and Sinus Clinic, we wish you a warm welcome and hope to serve our patients for many years to come!